Now that you've received or bought a brand new DVD Recorder, how do you hook it up to your TV? This tutorial will focus on connecting your DVD Recorder to your TV, whether you have Cable, Satellite or Over-the-Air Antenna as a TV source. There are also tips on how to hook the DVD Recorder up to a Dolby 5.1 Surround Sound System. Let's get started! The first step to connecting a DVD Recorder to your TV is to determine what type of connection you want to make between the TV source (Cable, Satellite, Antenna), the DVD Recorder and the TV. This is usually determined by the outputs and inputs available on the DVD Recorder and the TV. If you have an older TV that only accepts RF (Coaxial) input, then you would connect the RF output (a coaxial cable) from your TV source (in my case a Cable Box) to the RF input on the DVD Recorder. Then connect the RF output from the DVD Recorder to the RF input on the TV. This is the most basic (and lowest quality) option for connecting a DVD Recorder to any TV. If you want to use higher quality cables, then you may want to connect the TV Source (Cable and Satellite only, not Antenna) to the DVD Recorder using Composite, S-Video or Component video and audio cables. To use composite cables (also known as RCA, the yellow plug is video, the red and white plugs, audio): Plug in the composite cables to the RCA outputs on the back of your TV source and then plug in the composite cables to the RCA inputs of the DVD Recorder. Then connect the RCA outputs from the DVD Recorder to RCA inputs on the TV. To use S-Video and RCA audio cables: Plug in the S-Video cable to the S-Video output of the TV source. Plug in the S-Video cable to the S-Video input on the DVD Recorder. Next, connect the RCA audio cable to the output on the TV source and the input on the DVD Recorder. Finally, connect the S-Video cable and the RCA audio cable to the output on the DVD Recorder and the input on the TV. To use Component Video cables and RCA audio cables: Connect the Component Video cable and the red and white RCA audio cables to the outputs on the TV source and the inputs on the DVD Recorder. Next, connect the Component Video cable and RCA audio cable to the outputs on the DVD Recorder and the inputs on the TV. Now that the TV source (either Cable, Satellite or Antenna), the DVD Recorder and the TV are all connected, you need to configure everything to make sure that TV is coming through the DVD Recorder, for recording and viewing. Turn on the Cable Box or Satellite Receiver, TV and DVD Recorder. If you connected everything using the RF connections then the TV should be passing through the DVD Recorder and displaying Television on the TV screen. To record in this mode, you would need to tune to either channel 3 or 4 on the TV and then use the DVD Recorder TV Tuner to change channels and record. If you made connections using either Composite, S-Video or Component cables, then to view or record TV, two adjustments need to be made. First, the DVD Recorder needs to be tuned to the appropriate input, typically L1 or L3 for rear inputs and L2 for front inputs. Second, the TV also must be tuned to the proper input, on a TV usually Video 1 or Video 2. If you have a Dolby Digital 5.1 Surround Sound A/V Receiver you can connect either a Digital Optical Audio cable or Coaxial Digital Audio cable from the DVD Recorder to the receiver to listen to audio through the receiver. 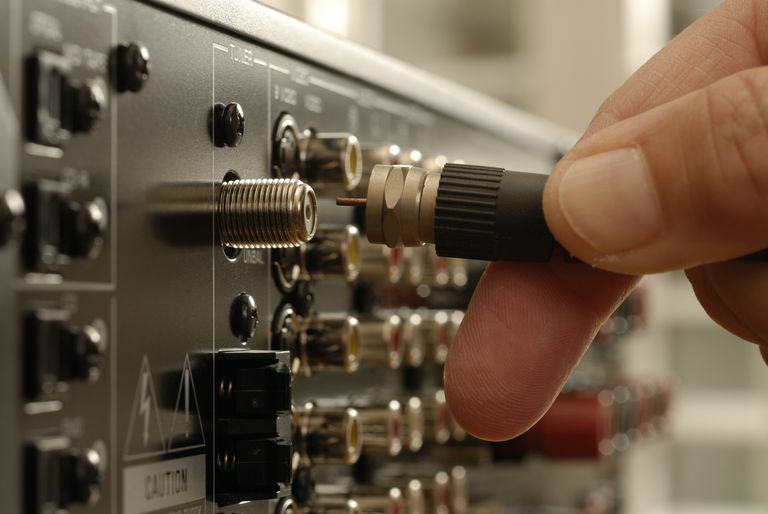 If Cable TV is coming in directly from the wall with no Cable Box, the only option is to connect the Coaxial cable to the RF input on the DVD Recorder and then output to the TV using either RF, composite, S-Video or Component audio and video cables. Some DVD Recorders require you to make an RF connection as well as an A/V connection in order to use the Electronic Programming Guide (for example, Panasonic DVD Recorders that include the TV Guide On Screen EPG). Always check the owner's manual before making connections. Feel free to use connection combinations when hooking up your DVD Recorder. For example, you can connect from the TV source to the DVD Recorder using a coaxial (RF) connection and then output using S-Video and RCA Audio to the TV. Make sure if you are using A/V cables to connect the DVD Recorder to a TV, that you change to the appropriate input on the TV. Use the best cables you can for connections. Video cables from lowest to highest quality are RF, composite, S-Video, Component. Which cables you use will be determined by the types of outputs and inputs on the DVD Recorder and the TV.